Talented apprentices and students in the air conditioning, refrigeration and heat pump sectors are invited to put their technical and professional knowledge to the test and showcase their potential in the 2018 SkillFRIDGE Competition Series. The competition is designed to tackle the impending skills crisis by promoting the exciting and varied career paths available within the sector to young people and apprentices already studying up to Level 3 RACHP. It provides an opportunity for apprentices involved within the sector to hone their skills, learn best practise, understand current legislation and use the latest products on the market. Competitors, and their respective training providers and employers, will benefit from having a unique platform from which they can demonstrate their technical and professional knowledge and outstanding skills in an exciting and pressurised environment. With the Department for Education reporting that people aged over 25 and over accounted for over 46% of apprenticeship starts in 2016/17 (DfE/EFSA Further Education and Skills, Nov 2017), the 2018 SkillFRIDGE Competition Series will see the removal of the upper age limit during the national stages. For more information, or to register an apprentice, visit www.skillfridge.co.uk. A report by the Centre for Economics and Business Research (Cerb) identified the vital need for action, noting that an extra 182,000 people with engineering skills were required each year leading up to 2022, but currently there is an annual shortfall of 55,000 people. Skills competitions such as SkillFRIDGE provide companies with a unique opportunity to show their support and do their part in tackling the skills crisis, as well as a chance to promote their brand to the next generation and wider industry. Companies that have already pledged their support include lead sponsor Toshiba Air Conditioning, brand sponsors A-Gas, Advanced Engineering, Dean & Wood, Fieldpiece, Refrigeration Wholesale Ltd, Safeflame, VULKAN Lokring and association sponsors Building Engineering Services Association (BESA), FETA, The Institute of Refrigeration (IOR), REFCOM and IOM3. To find out about the range of sponsorship opportunities that are available and how it can benefit your business, contact Karena Cooper on 01622 699 150 or at kcooper@datateam.co.uk. Competitors from the 2017 series showcased their skills to exhibitors and visitors at The HVAC & Refrigeration Show, where they demonstrated the knowledge they have gained throughout the competition and even had the opportunity to use some of the latest equipment to hit the market, including the brand new Sauermann Si-RM4 smart wireless manifold probes. The ergonomic tool fits into tight and compact spaces, and provides installers with a Si-Manifold app with Bluetooth up to 30 metres and the ability to take a number of important readings in an all-in-one device. The Si-RM3 has been globally tested but the SkillFRIDGE 2017 competitors were amongst the first to put it through its paces. 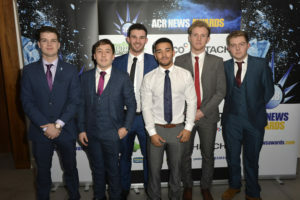 The finalists were also invited to attend the ACR News Awards, where gold medallist Jack Culhane received the SkillFRIDGE trophy and his training provider, Eastleigh College, was awarded the SkillFRIDGE shield. The night also presented a further cause for celebration, as SkillFRIDGE 2017 finalist Stephen Taylor was honoured with the ‘Apprentice of the Year’ accolade.